This is a double-handled vase made by the firm of Reinhold Hanke. 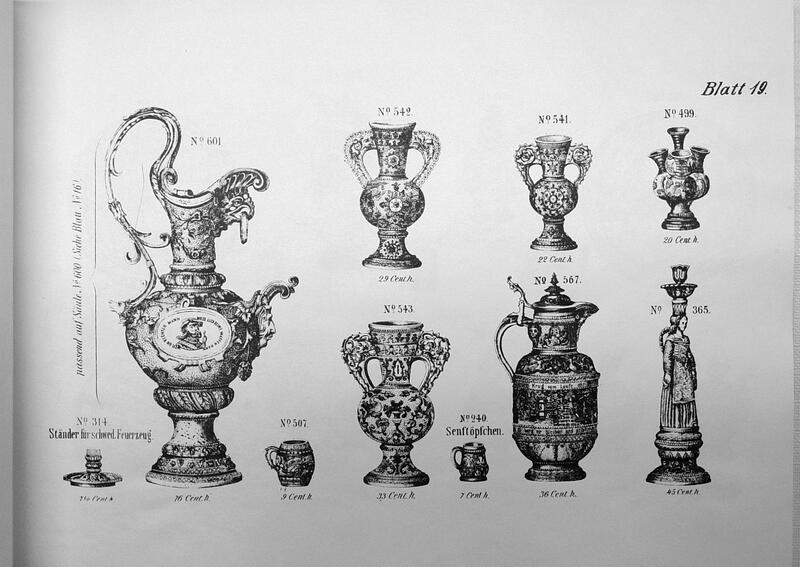 The vase was made in the second half of 19th century. It is listed as Exhibit 121 in the catalogue Reinhold und August Hanke, Westerwälder Steinzeug, Historismus - Jugendstil : Keramikmuseum Westerwald, Dt. Sammlung für Histor. u. Zeitgenöss. Keramik Höhr-Grenzhausen vom 30. November 1986-1. März 1987. It is also listes on page 19 of Reinhold Hanke catalogue. It is 29 cm high, made of ivory-colored stoneware, blue, light green, dark green and brown glaze, decorated with oriental tendrils. The vase is signed on the base by Peter Röstov (? ), who probably was the artist.